When I found out that an acquaintance of mine – who I looked up to and respected – had badmouthed and insulted my main area of expertise, I was pretty hurt. I had been informed that when he was asked by someone if he thought there was any value in link building as an SEO practice, he said that he didn’t think there was and that it’s a job “a monkey could do.” Charming! Although his line of work isn’t primarily SEO, it is closely related, so I was quite shocked – but also somewhat relieved – to find out that his thoughts were based on the ignorant belief that there’s only one thing link builders do, and that’s simply to “submit links to general directories.” Although directories can still be included as part of an all-round link building strategy, gone are the days when SEOs could rely on link directories alone. Of course, with Google’s on-going changes to its search engine’s algorithm, for an SEO to concentrate on just directories, they’d have to be absolutely bananas! 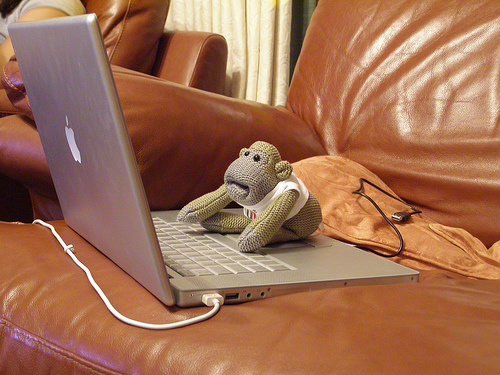 (Sorry, couldn’t resist – there had to be a monkey-related pun in this post somewhere!) Some SEOs argue that link building (a major element of off-site SEO) is a stronger SEO signal than on-site SEO (although many will also argue that both should be considered for the best possible chance of success, as one element being weak can let the side down overall). So it’s crucial that an SEO strategy involves a well-rounded and varied link building strategy, particularly in competitive industries. Then there’s the subject of how many factors come into Google’s search engine rankings, and how often the search engine algorithm is updated. The answer? They “use more than 200 signals… and [they] update these algorithms on a weekly basis” (source). 200… Two years ago, when it was first mentioned by Matt Cutts, folks over at WebmasterWorld made an attempt to list them, and the provisional list had at least a dozen variables affecting the finer details of an individual in-bound link, including the anchor text used, its position on the page, its relevancy to the content as well as a whole bunch of other factors. It’s complicated stuff. And that was two years ago! There’s probably more now, or if now then at least they’ll have changed, with some variables gaining more importance over time; others less. But don’t just take my word for it. When I first heard about the monkey comment, I decided to get the feedback and opinions of a few fellow SEOs via Twitter. I wrote this post because I wanted to defend what we do from a silly, harmful comment. But if this blog post – and my website domain as a whole – garners links in the process then I’d consider it an added bonus. This post is potentially a link-earning bit of content – a link building consideration in itself. But hey… We’re only monkeys, right? Seriously though, you’ve hit the nail on the head. It’s not exactly in the same category as brain surgery, but it’s not a particularly simple or straightforward job, either. I think it depends on what kind of links you’re looking for – if you want to build a sustainable, natural link profile then no, it’s definitely not a ‘monkey job’ – as this is an art, and usually requires you to speak to the right people, get your product in the right places, take the right approaches, build relationships and most of all build a strong brand that people want to associate their content with. In addition to this, link prospecting requires a certain amount of know-how and understanding of SEO. I think that there are elements of link building that are tedious, but I would say that this is the same in most professions – there is also a big distinction between the less exciting parts of projects and ‘monkey work’. Well said! There are easy links anyone can go out and get, that probably do not require any type of skill or brainpower to obtain, but then they’re not going to be particularly good links, either. It’s getting to the point that to be a good off-site SEO requires more than just being able to fill in a few boxes and press a ‘Submit’ button. Takes smarts and creativity, just like you and the tweeters I’ve quoted have said. Isn’t SEO itself a pointless black art? Wouldn’t your resources be better spent creating QUALITY sites (not just SEO-ed garbage) with genuinely interesting content that people would want to read/share/comment on any way? I agree there are “basics” that any webmaster is a fool not to adopt, but I think people should stop trying to trick the system and work on the quality of their websites. Hi SEpticO, cheers for the comment. SEO is not “pointless,” nor is it a “black art,” otherwise no one would be doing it and every single SEO ever would be regarded as a spammer, respectively. I agree that time and resources should be spent creating quality sites, but as I like to say, what’s the point in creating something wonderful if no one gets to see it? What’s wrong with giving it a bit of a push in the search engines, helping its exposure and to help it get the attention it deserves? Likewise, a poorly designed site that does rank well is hardly going to win people over, either. Dedicating time to both areas is key, not just one or the other and then crossing your fingers and hoping for the best. It’s not a case of “tricking the system,” either (at least not in terms of ethical, white-hat SEO). A quality website, with quality content, and with quality links encouraged… these can all still be optimised to an extent without hugely impairing the quality at all, which of course would be the best of both worlds. What’d be wrong with that? I agree that a big part of SEO is creating something that serves a purpose, has value for users and is generally ‘linkworthy’, however I also think that on-page optimisation is still very important.